“The best darn used trucks you’ll find anywhere!” – per our customers! 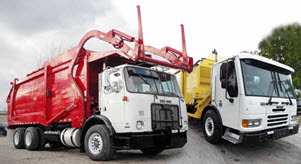 When it comes to garbage trucks, we do it all! Nobody beats our turnaround time or our quality. We work hard, and we work fast. And our customer satisfaction is always high. What do YOU need? We’ve got you covered. Sometimes our customers just need something added to their truck, or replaced.